One of my favorite childhood poems, and it has never rang so true as it does today. I spent the day in bed, trying desperately to will the food away from my thighs. Got up at about 2:30 and decided to take a shower. Wanted to try a new shower gel and ended up finding an anti-cellulite cream. If God speaks in symbols and signs, then God is screaming at me. So, I’ve decided to give it a try. The instructions say to use religiously for one month, twice a day, rubbing the effected area with upward motions. Today is day 1… I’ll check in again at around day 30 and tell you how my thighs are looking. 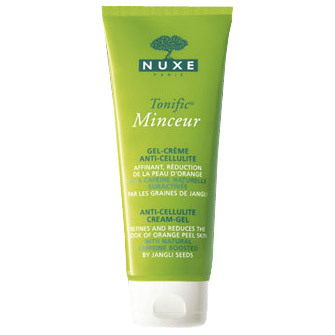 In the meantime, if you wanna try along with me, purchase a tube of Nuxe Tonific Minceur Ant-Cullulite Cream-Gel. Nuxe TONIFIC® MINCEUR Anti-Cellulite Cream-Gel is a patented breakthrough that helps improve the appearance of Cellulite with an active ingredient of caffeine, which is one the best fat-fighting agents on the market today. Boosted by jangli seeds, derived from an Indian plant used in ayurvedic medicine, this cream-gel offers optimum anti-cellulite performance. The exclusive combination helps encourage the elimination of fatty deposits, peruvian Liana helps prevent new deposits from forming, while amazonian plants help tone skin. Apply morning and night, massaging with an upward motion focusing on specific areas, (thighs, buttocks, hips, stomach, etc.). The results of an independent clinical study of 113 women found that after one month of applying the product twice a day 79% noticed a reduction in the appearance of cellulite, 86% noticed a reduction in the look of sponginess, and 84% noticed a reduction in the look of orange peel skin. I’m not going to lie, I’ve always been a little suspect when companies boast about the “wrinkle eraser” or “celulite stopper” but hey, who am I to disobey God’s intentions?